New from Gin House Records. Recorded at Chapel FM in Leeds by Adam Richards onto 4-track tape. Mastered at Ghost Town by Ross Haldon. Howlin’ Ric’ himself claims how important American artists are to him. Bringing that vintage U.S. vibe into modern British music can be a gamble and a bit of a risk. The current scene is largely composed of musicians who rarely dabble with ‘50s artists/sounds. 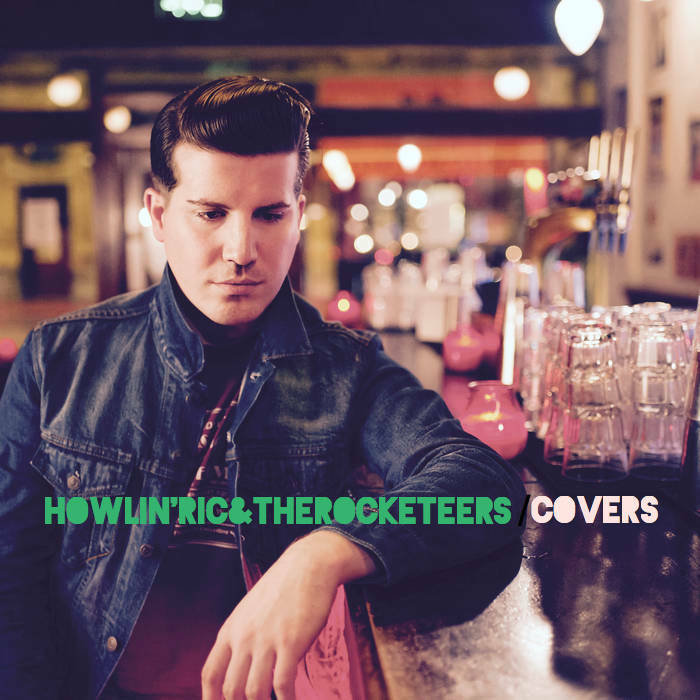 Howlin’ Ric & the Rocketeers’ lead has the slick hair and handsome look: the stylish clothing and logos/artwork that takes your mind back to the legends of Rock ‘n’ Roll. Part-kitsch; part-retro. : you have a musician that puts his heart and soul into everything he does. Those of you thinking negatively about the songs- they will be for older listeners- need to investigate our hero and reassess their preconceptions. I am a fan of The Baseballs: a German Rock ‘n’ Roll band that can be compared to Howlin’ Ric & the Rocketeers. The German band mainly performs cover versions- their take on Rhianna’s Umbrella among their most memorable- but are by-no-means uncool and fuddy-duddy. Our Yorkshire group define cool and have such a wonderfully rich and smile-inducing sound. 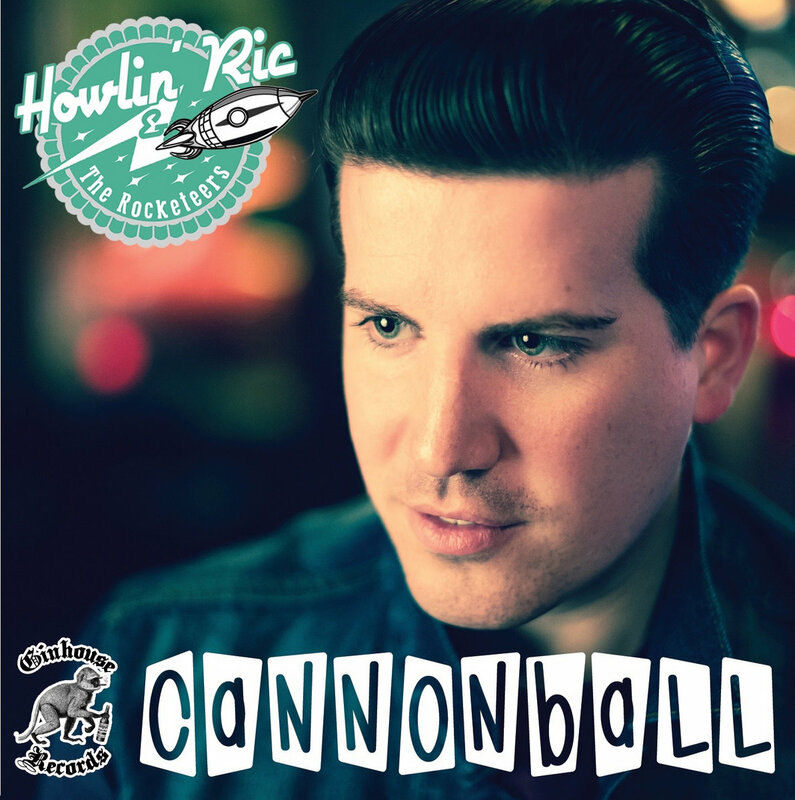 Whereas Howlin’ Ric & the Rocketeers have done covers before; their latest E.P.- the exciting and nuanced, Cannonball- is their most confident and personal work to date. The five-track release sees the band embrace fully their influences- the U.S. Rock ‘n’ Roll legends- and give it a modern twist. That lo-fi production and slow-burning sound may go against the impulses of modern recording: what you get is music that reveals new insight and detail over future listens. Maybe the song will take a few spins to grab attention: when they do, the effect and reaction is stunning. Having followed/championed The Holcombe Family String Band before; it is wonderful discovering another band that has similar strands and sounds. Cannonball is the first E.P. from Howlin’ Ric & the Rocketeers. Difficult to see how the band has evolved and developed: the best thing one can do is discover the E.P. and judge for yourself. I’ll Keep on Trying- a cover of the New Orleans Jazz musician Eddie Bo’s song- was unveiled last November. A chance to see the band tackle another musician’s work- doing so with aplomb and confidence- you get a great reinterpretation of an old favourite. Whilst Bo’s original is quite obscure and unheard-of: here, you get the song given a fresh lick of paint and brought to life. The vocal/composition remains fairly faithful to the original whilst showing plenty of unique insight and new nuance. It is a great starting place for anyone new to the band and the genres of Rock ‘n’ Roll/Rhythm-and-Blues. Cannonball is a brave leap that shows the guys are just as comfortable with their own material. Whilst songs are built from exciting numbers- Sweet Ella May is a largely instrumental track from Earl Hines; Cannonball (Damien Rice) and Hold My Hand (Hootie and the Blowfish) are familiar titles- you get songs that sound like they were penned in the ‘20s and ‘30s. I am not sure what has inspired the songs- whether they were motivated by old records or relationship insights- but the five-track E.P. has consistency, plenty of layers and diversity. Every track has its heart in classic Blues/Rock ‘n’ Roll with a modern twist given to every moment. There is an immense confidence and passion that comes through in every song from the E.P. You would expect some nerves and uncertainty to show itself on a debut E.P. : the Yorkshire clan suffer no such fate and sound completely ripe, ready and assured throughout. It will be great to see what the future holds and whether they can parlay their sound into a full-length album. I was keen to single a particular track from Cannonball to show what the band was all about. On the suggestion of our lead- who wanted the title track featured- it was great to sit down with Cannonball’s most instant track. It opens proceedings and makes an instant impression on the listener. Scuffed strings welcome the track in and ensure the energy and intrigue is there right away. Our hero sounds a countdown- a number run down that calls for unity- and you get a spirited and lustful opening. The band lend their double bass and guitars together to give a hoe-down and Rockabilly blend that gets the feet moving and looks back at Rock ‘n’ Roll masters of old. Everything is done with affection and genuine passion for the genre: the initial moments take you back to the ‘50s (and earlier time periods) and have a real retro. feel to them. The guys show how tight-knit they are with an introduction that leaves little room for breath and pause. Our hero wants (the girl) to put her Sunday best on- it seems as though the pair are perhaps hitting the town. When hurt strike it will be “like a cannonball”, it is said. Allowing those vocals to press and cut through the mist- they are put high in the mix to ensure they resonate- you get immersed in a song with some mystique to it. The coda and mantra- pain and split will hit like a cannonball- you wonder whether we are looking at a relationship in trouble. Maybe there is more innocence at the root but you feel like something fragmented is being talked about. From those early words of Sunday dresses and hitting the town- you think the couple is going on a playful date- you start to think about something more negative and fraught. The band combines vocals when the chorus hits- to reinforce the importance and prescience of the song’s title- and you cannot help but be seduced by the drama and passion unfolding. Howlin’ Ric is a frontman whose voice is hard to compare with anyone else. You get little impressions of past artists- a touch of Little Richard and his contemporaries- but to be fair, there is such originality and personality in the vocals. That is a rare thing in today’s scene: so many musicians copycat others and are far too close to other musicians. By having that distinct voice and sound: it ensures Cannonball sounds new and completely fresh. The band would be betraying their instincts were the song to be completely modern and fresh. The composition and production have their heart lodged in the golden era of Rock ‘n’ Roll- the production is impressively lo-fi and sparse. All the best songs have some obliqueness and beg for interpretation. Gives the themes/mass of Cannonball- songs that have purity and celebrate love- it is hard to extrapolate anything negativity or heartbroken from the title track. Those gut-hitting sensations keep coming back and make you wonder. Love will spin you “like a hurricane” and knock you dead: take you off your feet and cause quite a sensation. I feel like our hero has seen pain and heartache but is (essentially) celebrating his beau. There's effusiveness and passion in the performance- without spite and sadness- your mind looks at the positives and soul nourish of love. The band backs our lead with a catchy and hypnotic composition: it spirals and twirls with dancing eyes and smiling teeth. Lighting the fuse and letting it go- whether lighting up love or setting off a bomb of hurt- the vocal grows more rapturous and emphatic as the verses progress. I always love discovering a singer that is able to switch from tender to wracked. Howlin’ Ric has that Blues soul, and as such, his voice can reach electrifying heights and really cut like a knife. Whether Cannonball was influenced by an older song- I have been searching the Internet to see if it is a cousin of another song- but you get something universal and mysterious all in one. As the notes progress; I start to think more deeply and my mind goes to-and-fro. Punctuating the pressing and insistent verses: you have compositional breaks that allow reflection and a chance for the band to shine. The guys do not throw too many instruments into the pot- mainly guitar and double bass- but that is appropriate given the song’s themes and nature. Blending the bliss of Rhythm-and-Blues with current Rock: you have instrumentation that will unite older listeners and young followers. It seems a lot of time has been expended to make the composition as compelling and catchy as can be. The notes dive and duck; the double bass scratches and strums- so much energy and pace come through. Cannonball is a song that will get the head and feet moving whilst ensuring the listener is fully involved and captivated. In spite of some sunnier weather- the band allowing the instruments to speak- the returning vocal is no less vivid and descriptive. Being twisted up inside- and contorted by the ways of love- once more you get another burst of pain. Maybe my mind is over/under-thinking but I'm always conflicted as to the true nature of the song. It is clear love has an effect and primal reaction- twisting the stomach and hitting the gut- but whether our man is happy or sad? It is clear his girl is beautiful and firmly in his mind: maybe there is tension among the love and devotion. The relationship is knocking him off guard: you always wonder the origins of the song and what has inspired the words. A deeply thought-provoking and interesting song: you cannot help but repeat it and try and get to the bottom. I know I say that about other tracks- ones that are not that obvious- but that is a good thing. So many songs are obvious and do not compel further listening. Cannonball is not only a terrific lead-off song- that ensures the E.P. gets inside the heart- but the title track makes you wonder and interpret. That is in no small part due to the band and composition. Our lead has a terrific voice that is so bold and heartfelt. At once controlled and investigative- looking at the vicissitudes and potential of love- it explodes and hits hard the next moment. That originality of tone and freshness- you cannot easily compare him to anyone else- it is a stunning performance. Making sure every word comes to life- and is done full justice- you have to commend that vocal. The rest of the band is no second fiddle, you know. The strings keep the song buoyant and constantly mobile. The E.P. has a lot of different strands and ideas: the title track is perhaps the most direct and memorable of the five. Packing so much into a short time (the song is not even three-minutes long); that is a testament to the musicianship and energy of the boys. They combine supremely and are a tight and intuitive band- that knows each other’s strengths. Backed by a production sound that strips the layers- and gives it a great, lo-tech rawness- and you can imagine this song filling the dance clubs of the ‘40s and ‘50s. Uniting decades and genres- from ‘30s Blues to ‘60s Pop- you have a song that has huge ambition but plenty of focus. Make sure you check out a wonderfully interesting and direct track- from a band who will inspire and impress. A palette cleanser that washes out the taste of Indie/Rock- the genres I am used to reviewing- it is great welcoming Yorkshire’s Howlin’ Ric & the Rocketeers to the fold. A band that has a great energy and connection: the songs recall the swing and cool of the ‘50s; given a modern take and adapted for current audiences. Whilst that blend of Rock ‘n’ Roll and Rhythm-and-Blues might not gain widespread appeal: that is not to say the boys will have niche appeal and struggle. Their music is very much for a particular audience: that audience/market is growing by the month. More and more music lovers are looking for something different- sounds that spark and differentiate from the norm. - and that bodes well for future fandom. At the moment, the group has a small (and devoted) following across social media: it is only a matter of time before those numbers swell and rise upwards. In the same vein; I would not be surprised to see the group played across national radio- it may take a while but they can get there. At this time, the guys are touring and playing around Yorkshire and beyond: it would be terrific were they to come to London and bring their music right across the U.K. I feel the scene needs a kick and energy boost: something that overhauls the bland mass of faceless Rock and sugary-sweet Pop music. Maybe it will take a few more years for this to happen- and variation to replace predictability- but there are small steps being made. Once again, Yorkshire is showing how things should be done. The county has plenty of ‘traditional’ musicians- that do not seem out of place in today’s music- but are expert when it comes to producing quirky acts. From Swing revivalists to Rock ‘n’ Roll lovers: barely a month goes by without another treasure presenting themselves. Like The Holcombe Family String Band- who are friends of Howlin’ Ric & the Rocketeers- it will take a while for the group to gain mass acclaim. At the moment, the boys are enjoying touring and seeing how the E.P. is received. Cannonball is five tracks of 1950s-recalling Rock ‘n’ Roll with a sprinkle of the modern day. Sweet Ella May is “sweet as apple pie” and drips with innocence and charm. The passionate vocal looks at the heroine: someone who needs to “come home” soon; her blue eyes and beauty being recalled in fond tones. The girl can see through lies and players- someone who gets a lot of attention- and has the heart of the hero. It is a song that assesses a loyal love and wonderful bond. With a constant swing and energy to it: you have a number that is among the E.P.’s most addictive and compelling. Following from the title track’s majesty and bliss: Sweet Ella May keeps that momentum going and ensures the E.P. does not suffer any weakness. Take My Hand is a slower number- with Country vibes to it- and a chance for the band to become more reflective and sensitive. Another sweet-natured love song: our man implores to his girl and wants her to take him by the hand. Whilst there is turmoil and uncertainty in the world: his sweetheart can rely on him and find security in his arms. The band keep the composition light and languid- the strings are woozy and vibrating- while the vocal shows plenty of soul, heart and passion. Take That Bottle has more rousing spirit and kick than its predecessor. The vocal is gristly and raw whilst the composition chugs and propels with each passing second. It is impossible to not get caught in the mood and rabble: get taken in by the wave of energy and underpinning threat. Our man wants the bottle taken away- as it makes him blue and down- and needs something more sobering and safe. Maybe drowning his sorrows or getting carried away in emotions: this is an invocation to have the temptation stripped away and control his turmoil. It is hard to say whether a relationship split has caused this drinking: maybe he is trying to forget the memory of a particular girl. A song that strays against the lyrical themes of the E.P. - the dedicated passion and burning love- we get another side to the band. If I Didn’t Care is the most direct and shortest tracks on the E.P. Ending the record with plenty of swagger and heart: you get a return to that positivity and loyalty. Our hero wants to make things better- whether for his girl or a friend- and offers support and comfort. There are fears and uncertainties burning: our boy will balm the wounds and offer strong hands and a loyal heart. The band combines wonderfully in a rich and adventurous composition that changes course and pace throughout the track. Ending the E.P. with a huge high: it shows what consistency and talent the guys have. ON the top of your priority list.